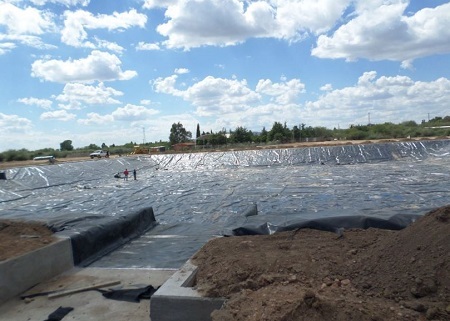 Maccaferri uses impermeable geomembranes and nonwoven geotextiles to build a water catchment basin for the community of “El Muerto y San Juan”. A water catchment basin had to be built in the community of “El Muerto y San Juan“Aguas calientes. San Marcos S.A. de C.V. chose to work together with Maccaferri Mexico to resolve the issues of waterproofing and protection of the catchment basin. Due to the inclination of the embankments surround the pond, trenches were cut in which to anchor the MacLine SDH geomembrane material. To prevent puncturing of this lining system, a protection geotextile MacTex N 50.2, was installed on top of the membrane. This protects the liner beneath, and was also anchored in the trenches surrounding the basin.